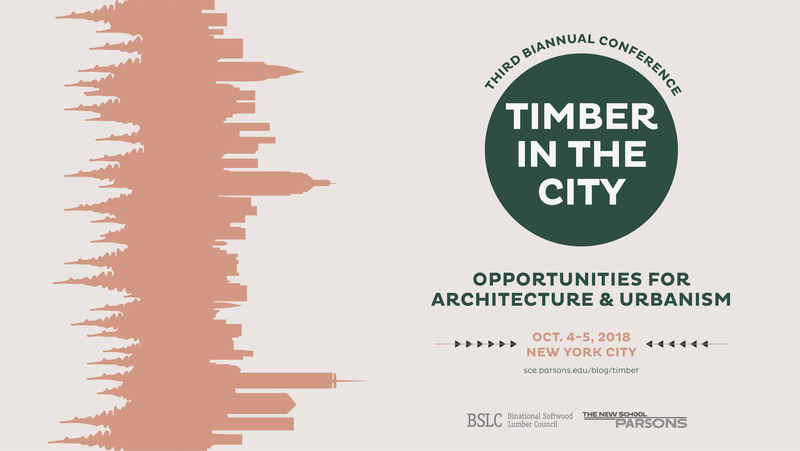 Parsons School of Design invites you to New York City this fall for the third biannual timber conference sponsored by the Binational Softwood Lumber Council. Timber has the potential to play a vital role in the design and creation of healthy and vibrant urban space on a large scale. This conference will look critically at the current use of mass timber and speculate on the opportunities that the material brings to architecture and urbanism. With voices from multiple disciplines, the goal is to build upon the present discourse around mass timber with an inquiry about the implications for architecture and design; health and material research; and global urbanization and climate change. The conference runs in parallel with the third Timber in the City Student Design Competition. Visit timberinthecity.eventbrite.com to reserve your spot. This first session sets the stage for the day’s events by combining a discussion of the latest timber technological developments and new opportunities for architectural design. This second session looks carefully at the health benefits and concerns of architecture realized with mass timber, examining the impacts on the body and mind. This final session examines the future of cities imagined and realized through timber architecture to meet global urbanization. « 2017 Street Seats Won Core 77 Community Choice Grand Prize!